Another important feature to look for is Drop-in Mode (sometimes also known as transparent bridge mode), which allows simple, risk-free installation of a dual WAN router to an existing network. Risk-free refers to the fact that there is no configuration change to any of the existing network components - router, firewall and clients. 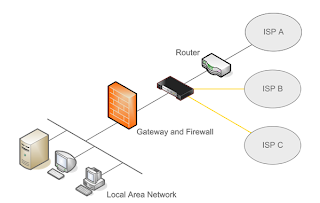 Typically in many office settings, you will find a router (T1 connection), a firewall (Watchguard, Sonicwall, CheckPoint and the like), and the internal LAN segment where user computers are located. 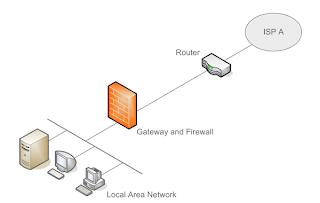 The dual WAN router should support a configuration to be "dropped in" between the firewall and router, while the LAN clients, firewall and router maintain the same configuration! Additional Internet links are then installed, and the device performs load balance, aggregation, failover among the multiple links. One common question about Dual WAN Routers is "does it truly bond multiple links together to form a single (and higher speed) pipe?" Or, "do I get download speeds of 4Mbps if I have two 2M DSL links?" The answer is yes, but you need to know what you're doing. As far as a single TCP/UDP (e.g. SMTP or mail) connection is concerned, it can only travel over one link at a time. Its speed is limited by the individual link that is chosen. In the above case - no faster than 2M bps. 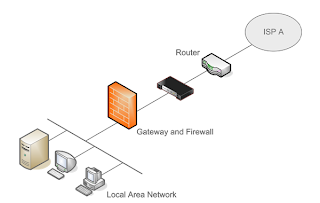 However, a Dual WAN Router is normally deployed an an office environment where you have multiple users. They will generate multiple, simultaneous connections which are then put onto the multiple WAN links, effectively making use of all available bandwidths. Having said that, a single user will actually take advantage of multiple WAN links in real life. As an example, it is the default behavior for Firefox and MSIE to create multiple, simultaneous HTTP connections to each web server when you browse the Internet. As well, by using a download manager, such as GetRight, Free Download Manager, a user can also achieve bandwidth aggregation results. If you look for a dual WAN router, chances are that you want the highest Internet reliability. For some companies, it is even a policy to avoid any single point of failure in their network, including the dual WAN or multi WAN router itself. VRRP (or Virtual Router Redundancy Protocol) is an industry standard designed to increase the availability of gateway devices (e.g. a dual WAN router) by allowing two or more of the same device to work in an active-backup fashion. For your next purchase, look for a vendor who is focused on this area and is producing enterprise-class products. Multi WAN can means two or more. And this PePLink Balance 700 multi WAN router has seven ports. "Are there some REALLY good ones (dual WAN routers) out there?" This is the question raised by Joe in his detailed review here. The author tested PePLink, Nexland, Hotbrick, Edimax among others. The PePLink Balance 300 turned out to be the best of the bunch.